Administrative Officer, Lecturer in Union Public Service Commission has invited applications for recruitment of 13 vacancies. The last date for application is October 11, 2018. Candidates for these positions will be selected on the basis of interview and experience. Educational Qualifications: – For the academic qualification and other information visit the UPSC Public Service Commission website. 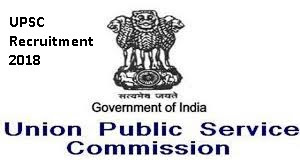 The Union Public Service Commission (UPSC; Hindi: संघ लोक सेवा आयोग) is India‘s premier central recruiting agency. It is responsible for appointments to and examinations for All India services and group A & group B of Central services. While Department of Personnel and Trainingis the central personnel agency in India. The agency’s charter is granted by Part XIV of the Constitution of India, titled as Services Under the Union and the States. The commission is mandated by the Constitution for appointments to the services of the Union and All India Services.